SGA members and non-members alike can take advantage of a special introductory price for a new SGA First Aid course. 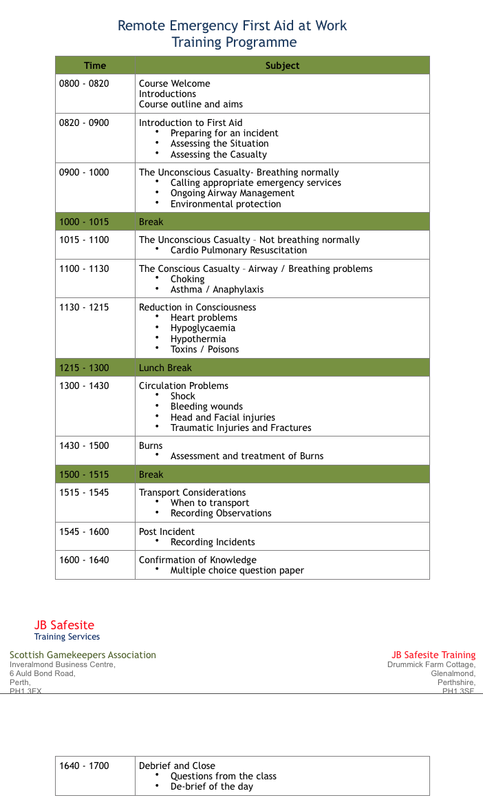 The one day course titled: Remote Emergency First Aid At Work is being delivered in conjunction with JB Safesite Training and, for the months of March, April and May 2015, will be available for £75 per person, plus VAT. The course covers dealing with an incident, assessing conscious and unconscious casualties, CPR, common medical conditions, burns, toxins and poisons, bleeding and traumatic injuries including gunshot wounds, head and facial injuries and moving and transporting. The course, developed by the SGA and JBS, has been designed to meet the needs of our industry, giving peace of mind to workers, owners and managers and helping estates achieve a safe, compliant and professional enterprise. Advantages are that the training is tailored to estate needs, is provided locally, is practical with real equipment, takes place over a single day and delegates receive a nationally recognised first aid qualification and a certificate specific to the industry. Owners and managers of the estate have a moral and legal duty to do what is reasonable to prevent accidents, injuries and health issues affecting staff, clients and anyone else affected by what we do. If you would like to take advantage of this opportunity, call the SGA office on 01738 587 515. See the day course outline below.